23 June 2010, at 10:30a.m. HUNGARY - Only a couple of months after the introduction of the S-line, Petersime is proud to announce that it has already received orders for over 1,000 machines of this latest generation of state-of-the-art single-stage incubators. 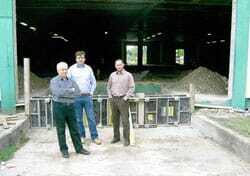 L-R: Mr István Szabó (General Manager and owner), Mr Ákos Szabó (Production Manager) and Mr Kornél Humpók (Hatchery Manager) in front of a hatchery building under reconstruction. The order for the 1000th S-line incubator was placed by Gallus KFT (Hungary). Gallus KFT was established in 1991 and is today's biggest broiler producer in Hungary. Gallus owns 15 parent stock farms, 3 hatcheries, a processing unit and a feedmill. They recently decided to replace all of their incubators with Petersime S-line BioStreamer™ models in order to achieve an even higher hatchability and even better quality chicks. Mr Ákos Szabó, Production Manager of Gallus KFT: „We have always been satisfied with our Petersime incubators which have been serving us for many years, but we needed to invest in the latest technology in order to meet today's market requirements." "We are very proud of this major success of our S-line. It is a confirmation that our continuous investments in R&D in order to develop incubators with the best return on investment for our customers is appreciated in the market," said Geert Callens, Strategic Business Development Manager at Petersime.